Every year the Greenwich Library, Greenwich Arts Council, YWCA of Greenwich, Greenwich Boys and Girls Club and the Greenwich Historical Society present an event called ‘Greenwich Reads Together’ in which a book is chosen for the entire community to read at the same time. 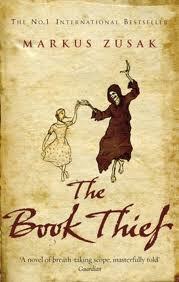 This year the steering committee has chosen The Book Thief by Marcus Zusak, which is about a girl who lives in WWII Germany. She steals to get by and then she finds books, learns to read and shares them with her neighbors and the Jewish man hiding in her basement. Starting March 20th, the library will host lectures, readings and other opportunities for the public to come together and discuss their thoughts on the book and its historical setting, all of which are completely free to attend. This community event features a discussion with Zusak and other experts on the Holocaust and life during the time of war, including Agnes Vertes, President of the Child Holocaust Survivors of Connecticut and Arthur Gottlieb, an acclaimed historian of 20th century warfare and preservationist of war related materials. Mark your calendars for this special event that starts off with music and poetry and finishes with two great films, all free to the public.